The other day, I received a copy of Physics Calculations (1952) by Max Wittman. So I though that I'd find what I could about this U. Samuel Vukcevich. For the first several seconds, the information was fairly unsurprising. Dr. Ukasin Samuel Vukcevich was born on 25 October 1928, in St. Clair, Pennsylvania, to Savo and Stana (née Punosevich) Vukcevich; Ukasin died on 15 April 2008. He was raised in West Hazelton and was graduated from its high school. He was a decorated veteran of the Marine Corps, serving at the end of World War II in the Pacific Theater. He went on to get a degree from Bloomsburg State College, and also earned degrees from Temple University and Rutgers Universi­ty. He taught high school and became principal of a high school. In the mid '50s, he married Anna Pejakovich (who died on 21 November 2011). So far, so good; then I see the word warden . Because, at some point, U. Samuel Vukcevich transitioned from high-school principal to, uhm yeah, prison superintendent. In fact, he gets special mention in various news articles and books because, on 24 November 1972, shortly after he became warden of New Jersey's Rahway State Prison, they had a riot, in which he was injured and taken hostage. In any case, it seems that he was an ardent advocate of using prisons to rehabilitate criminals, and that his belief in such efforts was what drew him, by the late '50s, into involvement with the penal system, beginning with juvenile reformatories. At the end of his career, Dr Vukcevich was working as an adjunct professor at Various New Jersey colleges and universities, and as a labor-relations negotiator. Keep going! Keep going! Keep going! 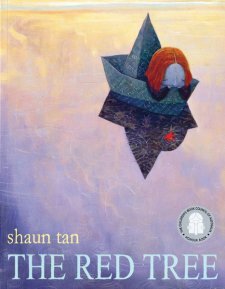 The Red Tree (2001) doesn't tell a story. It is a sequence of metaphors for depression, concluding with the expression of a principle of hope. The focal character is a little red-headed girl, and the metaphors are written at a level that a depressive child should be able to understand. I don't believe the particular message of hope, and so I very much doubt that I would offer this book to a depressed child. But if one wants to offer the message that things will surely get better to a despondent child, then this book might be an appropriate device. Otherwise, adults can appreciate the quality of the pictures. 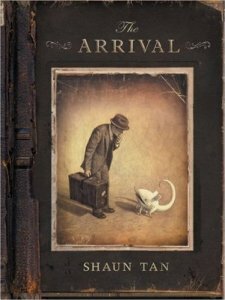 The Arrival (2006) is the most impressive of these five books, and one that I very strongly recommend for adults. It is the tale of a stranger come to a strange land — so strange to him that he cannot read the local script. To communicate that loss of communication, the story is told without words for the reader either; once past the title page, there are no words beyond the Roman numbering of chapters and whatever is said in that mysterious script. I'd far rather that you experienced the story as it was designed, so I will resist the temptation to reveal more to you. I will tell you that not only should this not be simply classified as a children's book, but that I think that a younger child should not go through this book for the first time without an adult beside him or her. 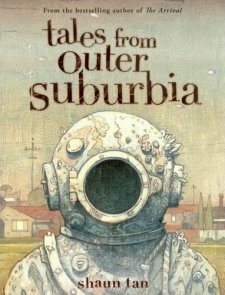 Tales from Outer Suburbia (2008) is a heavily illustrated anthology of short fiction — Eric is taken from it — such that the styles of the illustrations vary with the stories. 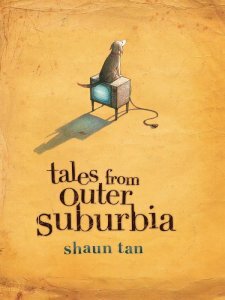 The stories are not uniformly as marvelous as is The Arrival , but Outer Suburbia is still an outstanding book, which I again recommend. In my opinion, the best of the stories is the very last, night of the turtle rescue ; it is very short but very powerful. Most of the stories are suitable for younger children, but it would concern me to have a younger child reading stick figures or wake on his or her own. The Lost Thing (2000), which arrived yester-day, seems to have slipped out-of-print since I ordered it. In any case, is about the discovery of an enormous, lost creature by a boy, told from the perspective of that boy. Not only do most people not recognize the creature’s condition of being lost; they don’t even recognize the existence of the creature (in spite of its size) until someone directs their attention to it. When the boy does this with his parents, they can see it only long enough to insist that it be sent away. 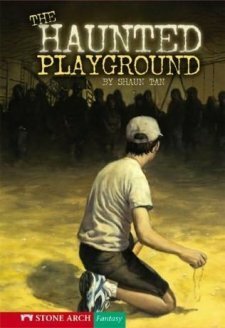 Although Tan has provided some interpretation of the story at his website, he actively resisted including any with the book itself. 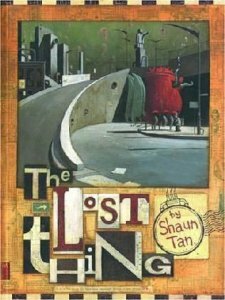 While I cannot as strongly recommend The Lost Thing as I do The Arrival or Tales from Outer Suburbia , it can be appreciated both by adults and by children. And I don’t think that one need be right at the elbow of a younger child when he or she first reads it, as opposed to Arrival and to Outer Suburbia . The Lost Thing , BTW, is being made into a short, animated film. Its name notwithstanding, Golden Age Comic Book Stories has been about a lot more than comic books (of any age). It has been simply awash in terrific illustration for pulp magazines and especially for fantasy work of the same genre. I encourage my readers to set aside a little time for a visit there. I hadn't known or had forgot about The Best of H.T. Webster , first published in 1953 and reprinted at least twice. 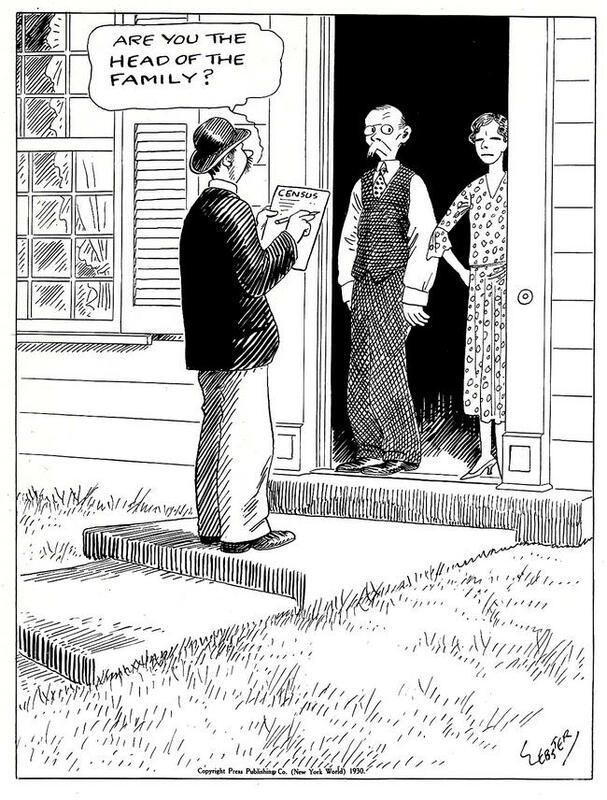 I was prompted by Mr Green's entry to look for a copy on AddAll.com. I found a first printing of the first edition, with the dust jacket in less-than-good condition, but the rest of the book in fine condition, at Lorrin Wong Books (his own site doesn't seem very functional, but he can be reached by way of Biblio and at AntiqBook.com) in Los Angeles for just $7 (plus $3.50 s&h). I ordered it early in the morning of 16 December, Mr Wong got it in the mails that same day, and it arrived on the next. While searching for editions of She by H. Rider Haggard, I discovered that the Non-Classics division of Penguin Books has begun publishing a line of Red Classics . One might argue that the Red Classics are not classics, or that the Non-Classics division publishes classics after all; but, really, something here ought to give way. My favorite history of economic thought is A History of Economic Reasoning by Karl Přibram. This book significantly shaped my thinking about the history of Western thought in general, and helped me to better understand some competing economic theories and how to resolve the conflicts amongst them. I ran across a copy of an older book by him, Cartel Problems: An Analysis of Collective Monopolies in Europe with American Application for sale on-line, and ordered it. It arrived on Friday. The copy is really in rather nice shape. But it bears the marks of an odd history. The book was published by the Brookings Institution in 1935. On the first page after the copyright page, in the inside margin, is hand-written 1-6-55 Gift Brookings Instit. So my guess is that they had a bunch of copies still in stock in 1955, and decided to reduce their inventory by giving them away. At one stage, it was in the browsing library established by William Allen White in Kenyon Hall of the College of Emporia, a Presbyterian institution in Kansas, which had a strong focus on religion at its inception, but became more secular in the '50s and '60s. The copy was moved from the White library to the John B. Anderson Memorial Library of the College. A book-plate of the Anderson Memorial Library was pasted-over some previous plate (which I suspect was also of the Anderson Memorial Library), and over a stamping in ink below that, which reads FROM WILLIAM ALLEN WHITE (which I think must refer to the library, rather than to the man, as White died on 31 January 1944). 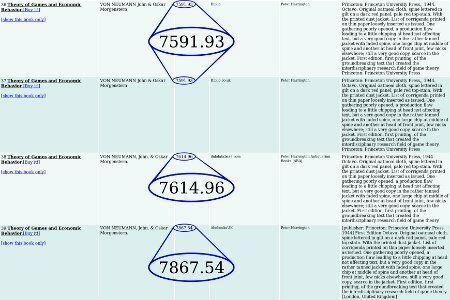 I believe that the 1-6-66 is simply a misreading of 1-6-55 , that the College was given the copy in 1955, and placed the copy in the browsing library, and that the volume was later moved to the Anderson Memorial Library. The Anderson Library itself was closed in 1968, but I presume that its entire collection was moved to the Laughlin-Lewis Library of the College. The College of Emporia was closed at the end of 1973, but the site and facilities were bought in 1974 by The Way International, a heterodox Christian corporation. The college was thoroughly renovated over the next dozen years, but closed and its plant sold at auction in 1991. I think that it was at about this point that the copy of Cartel Problems found its way to the Wallace Library of the Criswell Center for Biblical Studies, In Dallas, Texas. The Wallace Library stamped its name in ink onto the Anderson book-plate, onto the title page, and on a card-pocket on the inside back-cover (which bears no other marks). One might wonder what a place calling itself a Center for Biblical Studies was doing with a 1935 book on industrial organization. Indeed, the Criswell Center — now Criswell College — is a Southern Baptist institution, and the majors offered do not include social sciences or business. My guess is that the Center acquired this book in a lot, and just thoughtlessly put it in their stacks. Eventually, someone actually asked, and the book was liquidated. It isn't clear from the condition of the book that anyone has ever actually read the thing. With the exception of a price written in pencil on the free front end-paper, all the observable wear-and-tear is plainly the result of the scribbling, pasting, and stamping of librarians, or shelf-wear, or possibly attributable to the book having been moved a few times. William Allen White was an important progressive journalist and political activist, and (for reasons unknown to me) They Might Be Giants use an image of his face in the video for Don't Let's Start and elsewhere. The John B. Anderson Memorial Library was established by Andrew Carnegie in memory of a Colonel Anderson, who had made his personal library available to working boys, including Carnegie, and had later served on the Board of Trustees of the College. Additionally, there is a raised impression of ANDERSON MEMORIAL LIBRARY / EMPORIA,KANSAS on the title page and on page 101. Additionally, CRISWELL CENTER / FOR BIBLICAL STUDIES is stamped in ink in the margin of page 29. I have been reading Gut Feelings: The Intelligence of the Unconscious by Gerd Gigerenzer. Gut Feelings seeks to explain — and in large part to vindicate — some of the processes of intuïtive thinking. Years ago, I became something of a fan of Gigerenzer when I read a very able critique that he wrote of some work by Kahneman and Tversky. And there are things in Gut Feelings that make it worth reading. But there are also a number of active deficiencies in the book. 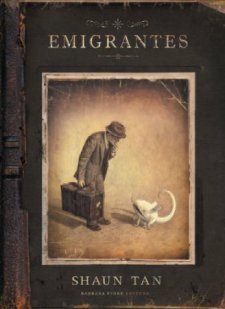 Gigerenzer leans heavily on undocumented anecdotal evidence, and an unlikely share of these anecdotes are perfectly structured to his purpose. Gigerenzer writes of how using simple heuristics in stock-market investment has worked as well or better than use of more involved models, and sees this as an argument for the heuristics, but completely ignores the efficient-markets hypothesis. The efficient-markets hypothesis basically says that, almost as soon as relevant information is available, profit-seeking arbitrage causes prices to reflect that information, and then there isn't much profit left to be made, except by luck — unpredictable change. (And one can lose through such change as easily as one might win.) If this theory is correct, then one will do as well picking stocks with a dart board as by listening to an investment counselor. In the face of the efficient-markets hypothesis, the evidence that he presents might simply illustrate the futility of any sort of deliberation. but uncertainty (as such) isn't to-the-point; the consequences of misspecification are what may justify ignoring information. It's very true that misspecification is more likely in the context of uncertainty, but one system which is intrinsically less predictable than another may none-the-less have been better specified. Tversky and Kahneman, 1982, 98. Note that here and in the following the term logic is used to refer to the laws of first-order logic. The peculiar definition has been tucked behind a bibliographical reference. Further, the notes appear at the end of the volume (rather than as actual foot-notes), And this particular note appears well after Gigerenzer has already begun using the word logic (and its adjectival form) baldly. If Gigerenzer didn't want to monkey dance, then he could have found an better term, or kept logic (and derivative forms) in quotes. As it is, he didn't even associate the explanatory note with the chapter title. She petted the cat and the cat bit her. The cat bit her and she petted the cat. because conjunction is commutative. Gigerenzer writes as if the lack of correspondence is a failure of the formal system, when it's instead a failure of translation. Greek δε should sometimes be translated and , but not always, and vice versa; likewise, ∧ shouldn't always be translated as and nor vice versa. The fact that such translations can be in error does not exhibit an inadequacy in Greek, in English, nor in the formal system. The term first-order logic refers not to a comprehensive notion of abstract principles of reasoning, but to a limited formal system. Perhaps the simplest formal system to be called a logic is propositional logic, which applies negation, conjunction, and disjunction to propositions under a set of axiomata. First-order logic adds quantifiers ( for all , for some ) and rules therefor to facilitate handling propositional functions. Higher-order logics extend the range of what may be treated as variable.